Using an awe-inspiring design aesthetic, The Spa at Four Seasons Resort Orlando at Walt Disney World Resort sprawls across 13,000 square feet of what’s become Orlando’s newest premier luxury property. 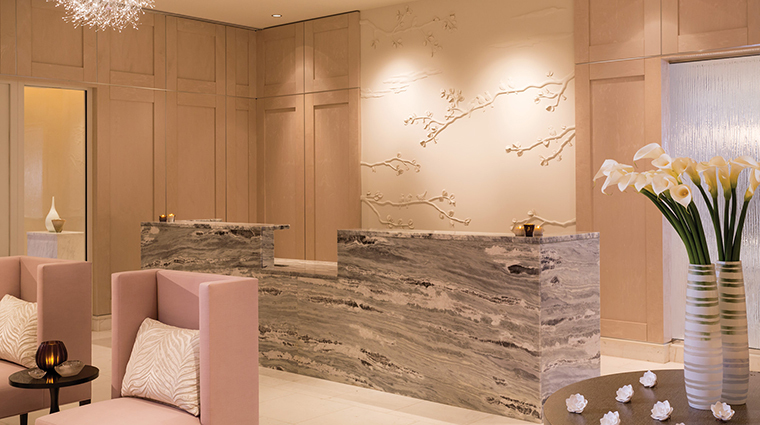 You will immediately note the marriage of textures and hues, which subtly evoke a spirit of simplicity and earthy minimalism, starting at the spa’s natural stone reception desk with native bird backdrop. Once inside the inner coffers, a natural palette of pale green, sand and taupe combined with lavender, mauve and white spreads across the communal spaces and the 18 treatment rooms, including four couples suites and two couples spa bungalows that are clandestinely tucked into the meticulously manicured landscape. At the spa’s helm sits director Derek Hofmann, who brings a red-carpet expertise with him from years at The Spa at Four Seasons Hotel Los Angeles at Beverly Hills. Treatments employ natural ingredients as well scores of luxury lines, including Natura Bissé, Innovative Skincare, Amala, Body Bliss, Turo, Intraceuticals and Pino. There is also a full-service hair and nail salon with three manicure and two pedicure stations. Spa sommeliers give you the opportunity to customize your own signature scent at the Aroma Design Bar. Your tailored aromatherapy blend can be added to spa treatments and bottled to bring home. The Oasis Pool, a lakeside and cabana-lined pool, is just a stone’s throw from the Orlando spa and offers a sunny milieu between treatments and a quiet place to enjoy a light lunch. While the spa serves as a tranquil adults-only space, the hotel’s close proximity to Walt Disney World inspired a few experiences designed for children, who can visit the salon for magical makeovers complete with Cinderella-esque hair styling, nail painting, sparkly accessories and a choice of eight different princess ensembles. Even boys can get in on the pampering, thanks to the Shining Knight package, which includes hair grooming, sword, shield and a commemorative knight certificate. Opt for an indulgent 80 minute spa and you will gain access to all of the resort’s pool areas, even if you are not a resort guest. Hoffman and his team have crafted a treatment menu rich with earth-inspired elements for 50- and 80-minute massages, facials and body treatments, many exclusive to The Spa at Four Seasons Resort Orlando. La Floridian body treatment is a popular body polish, massage and wrap trifecta. The Sticks & Stones Therapy, which uses sculpted basalt stones and birch wood massage sticks as an interesting take on the traditional hot stone rubdown. A cozy coed relaxation lounge sits at the spa’s center and serves as a peaceful, ocean-inspired space to while away a few minutes sipping botanical teas or fruit-infused water by a fireplace before therapists call your name. Or take a nap in the locker room lounge, home to a steam room, a private outdoor terrace, a whirlpool and an ice exfoliant feature. The experience shower provides a calming combination of water pressures (including nine body spray massagers), LED lights, sounds and aromatic essential oils.